Atlus have announced (via their Atlus Faithful newsletter) that their highly anticipated Persona 5 will be releasing in PAL territories on February 14th – the same day as the North America release. 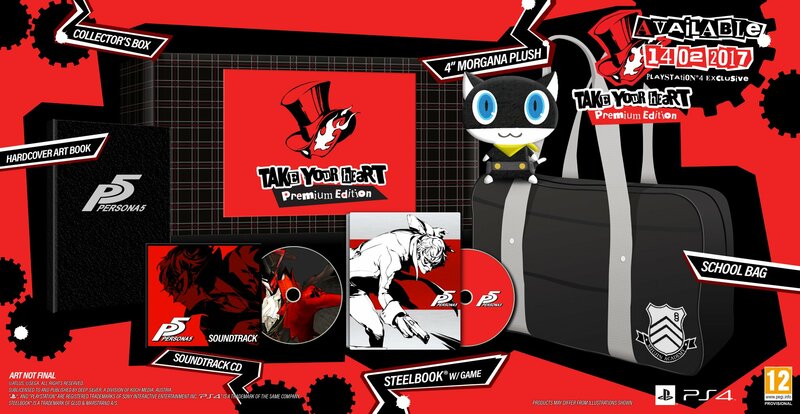 The “Take your Heart” Premium Edition and the PS4-exclusive Steelbook Launch Edition will also be releasing as well. This also includes a standard PS3 physical release as well as digital releases for both platforms. This is the same setup as the US release, right down to the contents of the premium edition. Deep Silver, the European publisher of Persona 5 have also correlated this on their own Twitter account. They also confirmed in the replies of the announcement tweet that the game will feature English audio and text only, as well as the Take your Heart Edition being priced at €89.99/£79.99 which you can read below. Persona 5 will release in Japan this September, with North America and Europe getting the game on February 14th, 2017.